When people hear the word "Coconut" they often think of it as being a nut but in actuality, it is a fruit that is grown from the coconut palm tree. Coconuts are rich in vitamins and minerals like calcium, potassium, magnesium and phosphorus. Typically, a 1 cup serving of shredded coconut is about 283 calories. Tips for Buying Coconuts: When buying a fresh coconut you want to inspect it for any external damage and/or mold growth. Once you have inspected it externally, you want to gently shake it to see if you hear any fluids rumbling around internally. Check it's weight...if it's semi-heavy or heavy...it would be a good one to purchase. Tips for Storing Coconuts: A fresh one can be stored in the refrigerator for 4-8 weeks depending on how ripe it was when you purchased it. Once cut, you can store the pulp or juice (coconut milk) in the refrigerator for up to 5 days or in the freezer for up to 8 months. 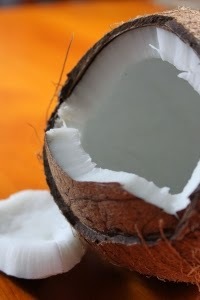 How to Open a Coconut: I like to pierce mine and drain the liquid out into a bowl or measuring cup. By draining it first, it will make it easier to cut open. This liquid can be used in various recipes too, so don't throw it away. Place the coconut onto a sturdy cutting board and use a very sharp kitchen knife or butcher knife to slice it in half, following the lines of the seam. Once it is open and in half, you can scoop out the pulp and use it in your various recipes or enjoy it plain. The pulp of the coconut can be used in a variety of recipes like: beverages, soups, sauces, desserts and more! It is a fruit that is often over-looked here in America and one that American's need to be incorporating into their daily diets on a regular basis. Although I knew how to choose a coconut I was not sure how to store the various parts of the coconut. Thanks for the info.